One year ago, emerging point-of-sale systems technology, including self-checkout, was on full display at the annual National Retail Federation (NRF) Big Show conference in January. Among the companies showcasing advances was NCR Corporation, which was at that time also celebrating 20 years since the installation of its first self-checkout solution. At the show, NCR introduced its vision-based scanners—replacing weight-based security systems—and biometric age verification for age-restricted products. Intelligent image scanners recognize items placed on the scanner. 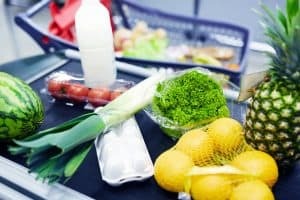 By offering a short list of suggestions instead of requiring customers to move through menus on the interface, shoppers can more quickly and easily scan non-barcoded items, such as fresh fruits and vegetables. The same technology is expected to help retailers reduce shrink due to “item swapping” theft, says NCR. For example, if a shopper tries to place an expensive item, like a bottle of wine, on the scanner while entering a code to weigh it as less-expensive item, like a bunch of bananas, the error is detected and the system alerts staff to intervene. The re-shaping of retail checkout and payment could be even more dramatic in the next ten years than in self-checkout’s first two decades, suggests real estate service company CBRE in a research report, “Future of Retail 2030,” which examines forty ways in which the world of retail will change. The company predicts that in-store checkout desk will be replaced by faster, cashless ways to pay. In addition to potential labor savings from checkout automation, retailers that use new checkout options may realize an increase in customer satisfaction. Although novelty was certainly one driving force, the line that circled the block at the opening of Amazon Go, the company’s cashier-less grocery store in Seattle, suggests that some customers are eager to embrace new retail payment options. In an NCR-conducted review of retailer and customer experience using self-checkout solutions, 54 percent of retailers reported an increase in throughput and 76 percent reported improved service with shorter, speedier checkouts. At these retailers, 31 percent now have more than half their baskets going through self-checkout. Finally, self-checkout also appears to help retailers build customer loyalty, according to a study published in the March 2017 issue of Service Business, “The effect of self-checkout quality on customer satisfaction and repatronage in a retail context.” Said researchers, “We conclude that successful use of self-checkout may “tie” consumers to a provider, representing a feature that differentiates a retailer from competitors. Of course, it’s up to loss prevention to evaluate the risks and identify possible preventive strategies associated with point-of-sale systems technology such as self-checkout, mobile coupons, touchless payment, mobile POS, and mobile self-checkout. This post was originally published in 2018 and was updated January 23, 2019.